For all of you technophiles out there, you probably already know what NAB is, and what sort of lovely things one can see and do at said convention in Vegas. 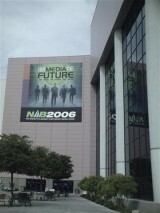 For everyone else, NAB stands for the National Association of Broadcasters, and the Vegas Convention Center hosts what is touted as the world\'s largest electronic media show. What formerly housed only things related to radio and television broadcasting now boasts anything tangentially related to film, video, editing, and assorted multimedia as well. My friend who works in IT in radio tells me that although she is fluent in \"geek speak\" and often gets confused looks from her non-technology oriented coworkers, this is a convention where one gets to meet the creators and designers of the products that one uses and is soon left bewildered by the level of complexity being presented. She said that her brain \"fills up\" too quickly, and at the end of the day her head is swirling with enough new information to make even her feel dumb. So one might imagine that someone such as myself was a bit overwhelmed on the floor. Those of you out there with massive tech-knowledge will be shaking your head that such an opportunity was given to such a newb, but I suggest that you focus on your networking, I\'ll focus on improving my knowledge base, and we\'ll meet and have coffee at NAB next year. That being said, I did my best to find the things that I thought would appeal most in the show to the gaming world. The company that most interested me was called Motion Analysis, a group mainly based out of Santa Rosa, CA. They are the leader in real-time 3D motion capture and animation. There are other companies, such as OGM in the UK and Viacon, but those companies focus in many ways on animation in post (which many of the videogames now currently opt for rather than real-time). I talked to Rita Maloney, Vice President of Marketing and Web Development while I was on the floor to find out what the latest scoop is concerning Motion Analysis. Rita told me that when her company was showing their technology even three years ago, most people were fairly confused as to what the technology was. However, because of the advent of many of the \"special features\" options on DVDs, many of us got to see motion capture at work on some of our favorite films. Her company was responsible for working on The Matrix, LOTR Return of the King (in conjunction with WETA), I Robot, Final Fantasy, Sky Captain and the World of Tomorrow, and King Kong to name a few. I first became aware of them while writing a book review for the Final Fantasy Movie, which discussed in detail the use of their technology. I was enthralled at the time, and have since become even more amazed at where their products and services are popping up. In regard to videogames, they have worked on NBA Live 2004, Return of the King, GTA III and Vice City, Unreal Tournament Freedom, Tony Hawk Pro Skater, and Hitman 2 (these titles are just a few of the over 150 games they\'ve had a hand in creating). Just to give you a notion of how the technology works if you\'re unfamiliar with it, they system is generally a grouping of around 12 \"cameras\" (see picture for clarification, as this isn\'t like what we normally think of as a camera), which are connected through Ethernet into a hub. However, for a smaller, \"fast and dirty\" set-up, you can use 8 cameras and a laptop). I was amused by the fact that the camera technology has to be approved by the FDA, because it is used on the human body (I made the analogy that it was like a tanning bed, except for the fact that the light emitted isn\'t really harmful at all to humans; they are using near infrared and visible red). Motion Analysis uses small reflective balls attached to 40 points on the body to map the image, but some companies use suits that have magnets on them (which must also be FDA approved) which are cheaper but quite a bit less accurate. An antennae-like receiver chooses the \'point of view\' that the images will be seen from, and is very easy to move. Rita said that the technology is changing about every two months, so you can imagine the \"speed of light\" at which this business is progressing. She said that so many people going digital helped immensely in increasing that learning curve as well. The cameras are fully upgradeable through internet downloads, and software is upgraded about once a year or so. Your training is included in the cost, which is accomplished through web-based training as well as live one-on-one. If you wanted to buy your very own set-up, it would cost around $100-300,000 dollars, depending on the package. But they make sure that everything is well supported, and are always getting feedback from their customers and utilizing it in planning for the future. I asked Rita where she saw this technology heading, and she said that there are actually tons of applications that are not film or videogame related already in progress. Medicine, sports physiology, and robotics/manufacturing are some of the applications, and the government and military is starting to utilize this type of technology for virtual training in dangerous situations or one\'s in which real-life training is limited. They are working on trying to perfect a \"feedback\" system where the person using the suits would receive input (think the VR helmets now, but much more evolved and streamlined, as many people get motion sickness, etc.) and would interact with elements in the real-time. My imagination immediately ran away with me on this one, and I think I heard MI music in the background. You can see Motion Analysis\'s handiwork on the aforementioned DVD extras, or The Discovery Channel has a documentary called Xtreme Martial Arts that shows off their work fairly well. It\'s not only fun to watch, but she said it tends to show what kind of debts the technology owes to biomechanists like Scott Banks. If you want more information about the technology, current uses, and where it\'s all headed, check out their website (www.motionanalysis.com). The next thing which caught my eye was the latest technology dealing with real-time 3D \"virtual sets.\" This is where a green or blue screen is set up, and the actors images are integrated into sets. When you think about this, don\'t think about the weather girl standing in front of a static background map. The camera is able to pan around the characters, and the integrity of the \"surroundings\" are maintained regardless of the POV. Keep in mind, this is all in real time. I watched as a couple sat on a couch in front of a screen and the monitor showed them sitting in a fully furnished living room. I also saw demos of a runway fashion show and a leisurely stroll down the street of an old-west town, in 3D, in real time. 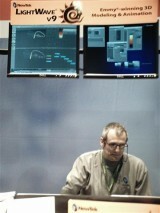 Finally, I found myself at the Newtek booth looking at the Lightwave v9 demo. This is used for 3D modeling and animation. The fan girl in me got a kick out of the fact that this system was one of the ones used in the movie Serenity. The bonus of Lightwave is that it uses general semantics rather than foreign terms for its applications, which is just another way of saying it uses common words that we all use rather than geek speak for its applications. This means it\'s a lot easier to teach people how to use it and have them retain that knowledge than some other system. Graham Toms, a former instructor at the Disney Institute in Orlando and traditional as well as CG artist, gave me the virtual tour. Lightwave does particle computation in four quadrants, has a node editor which creates node graphs vs. the traditional layer interface, and has a new ray tracer, among other things. It\'s set up to be bigger, stronger, and faster than what we\'ve seen before. And although I perhaps don\'t understand all of the intricacies of the program, it felt very organic and user friendly enough for someone like me to pick up and use. Graham ran a demo where he colored and textured a particle beam, then put in the speed and trajectory he wanted it to follow, and then finally instructed it as to what kind of physics needed to be applied. For instance, we could use this tool in education to simulate how different particles reacted in Earth\'s gravity as opposed to, say, Pluto\'s. And Graham is currently working on the way in which Lightwave can be used as a learning tool for younger kids, which would not only provide them with exciting ways of learning about science (as with the gravity idea above), but also would allow them to create artistically and to have a marketable technological skill at the same time. After we finished with the particles, Graham put his own artistic skills to work and made me a robot, which he then smoothed into an animated man of my dreams to finish off the demo of the new tools in Lightwave. 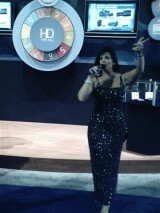 If you want more information about this, check out their website at http://www.newtek.com. I must say that this whole convention was a little overwhelming mentally. It\'s a much more subdued environment than E3. There are no explosions or rock concerts, and the notion of a \"booth babe\" is pretty much absent, which is probably a good thing because of this convention\'s more \"grown-up\" nature and its dual-gendered business focus. I looked at booths with all the new cameras (Arri always makes my heart go pitter-pat), and there were tons of demos by Avid, Eyeon, Final Cut, and Adobe, just to name a few. If you had the time, you could sit down and learn to do just about anything. I also found a great company called Artbeats, which basically is a giant storehouse of open source video along with education and training on how to utilize this type of material for your own (evil) purposes. Basically, what I discovered is that if I had enough time and money, I could single-handedly make my own film, edit it, and broadcast it to the unsuspecting masses. This is probably dangerous in the wrong hands, but I think that a girl has to have some goals. Or perhaps this all means creating our own videogames will be even easier in the future. All I know is that I walked out of this convention with sore legs and a mind that was overflowing with new information and technology. I think next year I\'ll try to put the Consumer Electronics Convention on my list of must-see events in Vegas. For now, I\'ll be gearing up for E3, and getting ready for all the booth babes, rock concerts, and explosions I missed at NAB.